Clemson vs. Florida State Series Clemson and Florida State have been among the elite teams of college baseball for some time. Both teams are ranked in the top 15 of all three college baseball polls this week. Clemson has won each of the last five meetings against the Seminoles, but Florida State still holds a 42-40 all-time lead in the series. Clemson, however has the upperhand since Florida State joined the ACC in 1992, as the Tigers hold a 24-17 lead in games played since that 1992 season. Clemson has been dominant at Kingsmore Stadium, winning 13 of the 15 meetings since Florida State joined the ACC. That includes last year when Clemson swept the second ranked Seminoles. 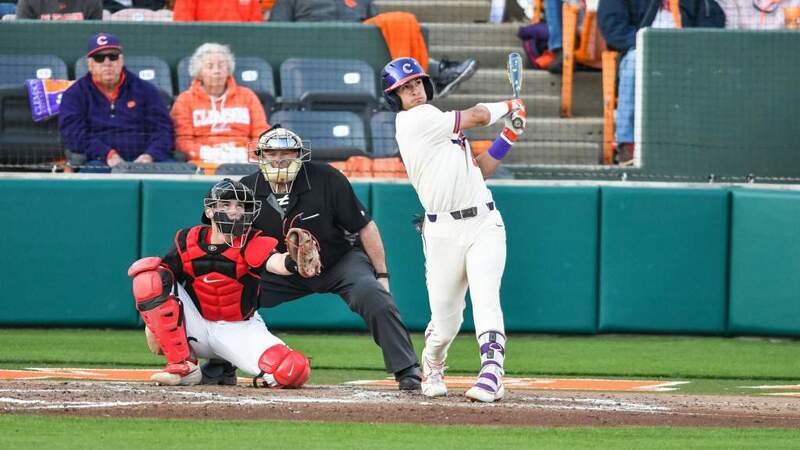 Clemson added a victory in the ACC Tournament on May 18, 8-4. That is the last time the two teams met. Florida State has an 8-4 lead in games at Tallahassee since 1992. The two teams have split 14 ACC Tournament games played in that time period (1992-00). The neutral site record shows how close the teams have been over the years. How good have the two programs been in recent years. Both teams have ranked in the top 20 of at least one poll in 36 of the last 41 games. Both teams have been ranked in the top 10 in 25 of the 41 meetings since the Seminoles joined the ACC. Florida State has been ranked in the top 10 in the nation each of the last 32 times they have met the Tigers. That streak will be extended this weekend. The Tigers have upset a top-10 Florida State team 16 times in the last nine seasons. Heading into this year, 16 of Jack Leggett’s 87 top-25 wins since he became Clemson coach in 1994 have come against Florida State. Clemson has beaten a number-one ranked Florida State team just once, an 8-4 win in Tallahassee in 1999. But, Clemson has beaten a Florida State team ranked as high as number-two in the country by at least one poll, four times. Three of those have come within the last five meetings between the two teams. Clemson beat a second-ranked Florida State team in the 1999 ACC Tournament, 8-7. The Tigers defeated a second-ranked Florida State team at Clemson last year by scores of 8-7 and 5-4. Tigers from Florida Clemson has five current players on its roster from the state of Florida. The list includes starting shortstop Khalil Greene and starting pitcher Matt Henrie. Both figure to play important roles when Clemson goes to Tallahassee this weekend. Greene is a native of Key West, FL. He is hitting .266 this season with three home runs and 18 RBIs. He led the Clemson team in hitting last year as a sophomore. Henrie is from Jupiter, FL and has a 3-0 record with a 2.08 ERA. The other three Tigers from Florida are Patrick Boyd (Palm Harbor), Seth Miller (Lakeland) and Ryan Klosterman (Montverde). Boyd, a preseason All-American, has played in just one game this year due to a back injury. He hopes to return to the Clemson lineup in mid to late April. Miller is a reserve catcher who is hit .378 for his 19 games and 45 at bats. Klosterman has played in 10 games as a reserve infielder and is 0-6at the plate. Greene has already been hit 15 times this season, just two off the Clemson single season mark of 17 set by Mike Hampton in 1994 and Gary Burnham in 1995. Greene has now been hit 41 times in his career, an all-time Clemson record. He is just in the middle of his junior year. Burnham owned the all-time record with 39 HBP recorded between 1994-97. Greene was hit five times in the New York Tech series, including a single game record three times in the first game of the series, a 24-3 win. That included being hit twice in one inning in that game, also a first in Clemson baseball history. Greene has now been hit by a pitch 15 times and walked 15 times this season. He has a .415 on-base percentage for his 109 at bats. 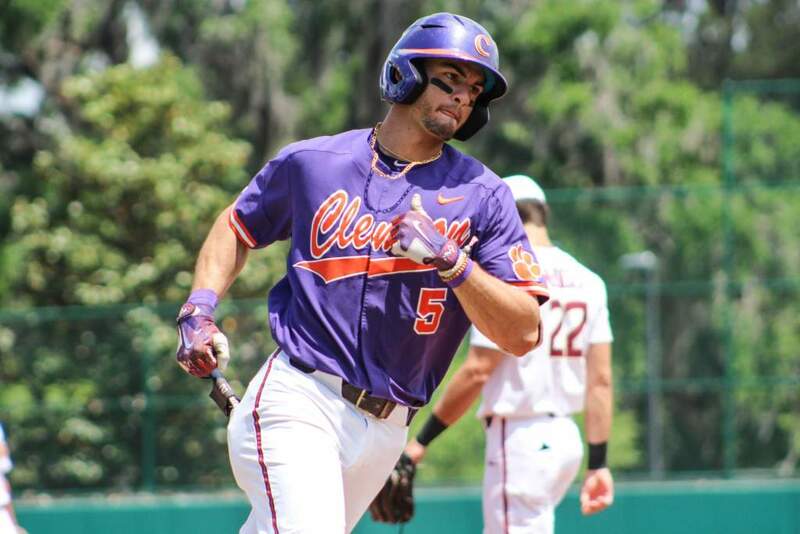 Johnson on a Hot Streak Clemson’s top hitter of late is first baseman Michael Johnson. The sophomore from Georgetown, SC leads the Clemson team in batting average (.414), slugging percentage (.793) and on-base percentage (.556) through the first 29 games. That would be a significant accomplishment, leading in all three categories for the course of a season. However, you don’t have to go back very far in the history books to find the last time that has happened. Current Tiger Khalil Greene accomplished that batting triple last year. Johnson has been especially hot of late at the plate. He has a seven-game hitting streak and has had multiple hits in five of those seven games. In the last seven games he is 15 for 27 at the plate and has seven RBIs. Including a two-home run game against New York Tech on March 30, Johnson has eight home runs for the season, second on the club. Johnson played in just 44 games last year and hit .306 with three home runs and 27 RBIs. He had a two home run game against Old Dominion on February 20th, but a hand injury limited his effectiveness at midseason. He missed 15 games due to the injury. Johnson has been around the game for some time. He played for his father, Mike Johnson, Sr., at Georgetown High. His father played college baseball for Erskine from 1966-69. Clemson hs been in his blood for sometime. Johnson’s grandfather, Farrel Owens, played football and baseball at Clemson in the 1950s. He also attended Clemson’s summer baseball came six consecutive years between 1992-97. Baker Leads in Homers and RBIs Clemson third baseman Jeff Baker has a seven-game hitting streak going. The sophomore from Woodbridge, VA has improved his batting average to .390 for the season after going 11 for his last 21 over the last five games. Baker has nine home runs and 41 RBIs to lead the Tiger team in both categories. He had eight RBIs and eight hits and seven runs scored in the three games in the New York Tech series. His best game of the year took place against Ohio University on March 11 when he had a 4-4 day and drove in seven runs. He also had a six-RBI game against Richmond in the second game of the year, a contest in which he hit a pair of home runs. Baker now has 20 home runs for the season. He led the Tigers in that category a year ago with 11. He had 64 RBIs and a .313 batting average last year also. Obviously he is going to improve on those figures this season. Clemson Pitching Improved Clemson’s pitching staff has made a strong performance in recent games. The Tigers had a team ERA of 6.52 through the first 10 games of the season. But, Clemson has now lowered that figure to 4.27 for the season. 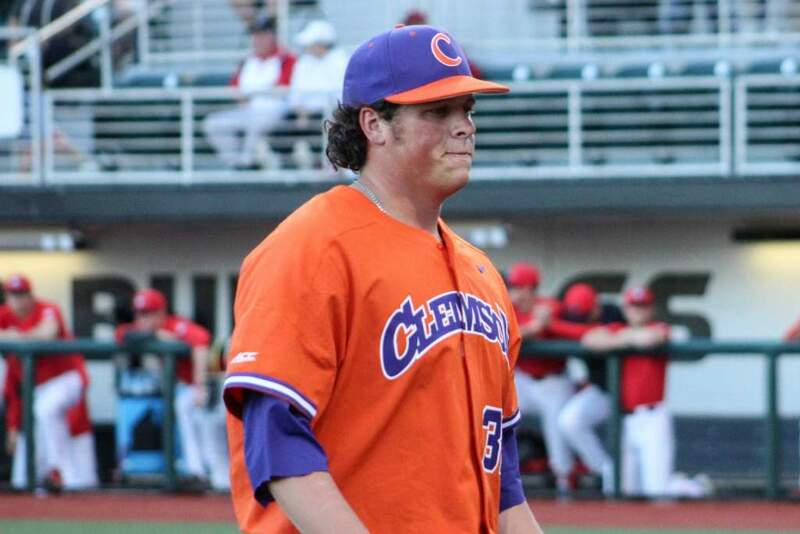 After allowing 63 earned runs in the first 10 games, Clemson has allowed just 60 in the last 19 games. Over the last 11 games Clemson has allowed one or no earned runs eight times. Clemson held a 20th ranked Wake Forest team to one earned run in each of its victories in Winston-Salem. The team allowed just one earned run in three wins over New York Tech last weekend. Four of the last five games Clemson has had double figures in strikeouts as a staff. Reba Leads Starters Steve Reba has been Clemson’s top pitcher this year. The junior from Fort Wayne, IN has a 5-0 record and a 1.99 ERA, both tops on the club. He has gained wins over Richmond, Oregon State, Ohio, Maryland and New York Tech. He has had more strikeouts than walks in every appearance and has a 40/12 strikeout/walk ratio this year. Reba had just two starts in 19 appearances last year, but had a 3-0 record with 33 strikeouts and just 15 walks. He has now won nine straight decisions and has not suffered a defeat since May of 1999. In other words, he has a perfect record this century. Henrie Most Improved Pitcher The “Where did he come from,” award for Clemson baseball for this year goes to Matt Henrie. The sophomore from Jupiter, FL and Cardinal Newman High School appeared in just five games in 1999 and had an ERA of 13.50. He pitched just 3.1 innings for the season. He red-shirted the 2000 season. So far this year, Henrie has a 3-0 record and a sterling 2.08 ERA. He has won his last three starts, victories over Maryland, Wake Forest and New York Tech. During those three games he has allowed just one earned run in 19 innings, has 16 strikeouts and just six walks. Henrie was named ACC Pitcher of the Week earlier this year when he shutout Maryland 7-0. He pitched six innings and allowed just three hits, no runs and struck out five of the 25 batters he faced. 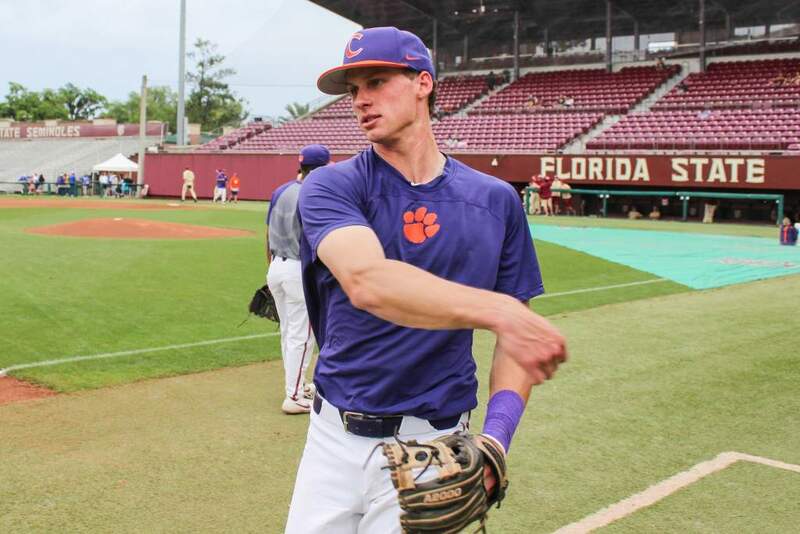 Clemson Falls to #28 Winthrop Jason Colson and Bennett Stapf belted home runs and Ben Thurmond earned his seventh win of the year, leading 28th-ranked (Collegiate Baseball) Winthrop to an 8-4 win over 8th-ranked Clemson at Doug Kingsmore Stadium. Winthrop improved to 27-5-1 for the season, adding Clemson to a growing list of standout college programs it has beaten this year. Winthrop has two wins apiece over Kentucky and Florida, and also has triumphs over Alabama, North Carolina and N.C. State. Tuesday night’s win was Winthrop’s ninth in a row, and 15th in the 16 games played since March 10th. Thurmond was outstanding with the exception of the seventh inning when he allowed a three-run homer to Casey Stone. He did not allow Clemson any hits in five of the innings he worked. He struck out eight and walked three in 8 1/3 innings of work. Winthrop wasted little time taking a lead. Josh Ury opened the game with a double to left center. One out later Jason Colson hit his team best seventh home run of the season off Tiger starter and loser Patrick Hogan. Hogan, a red-shirt freshman from Columbia, SC was making his first start as a Tiger. Clemson countered with a run of its own in the bottom of the first. With one out, Khalil Greene had back-to-back singles to left field. That brought up Jeff Baker, Clemson’s leader in RBIs for the season, and he delivered a single to right to score Frank. Winthrop increased its lead to 4-1 with two runs in the third. Todd Leathers opened the inning with a single to center. One out later cleanup hitter Bennett Stapf homered the left field. Stas Swerdzewski followed with a single. Kevin Lynn, who finished the inning with consecutive strikeouts. Lynn allowed just one run over the next five innings. That came in the fourth when Jordan Webb singled, went to second on a sacrifice, to third on a single by Ury and scored on a ground out to short by Leathers. Lynn had his best outing of the season. Entering the game with an ERA close to 8.0, the native of North Augusta, SC pitched six innings, allowed four hits, two runs, struck out seven and walked none. Clemson finally got to Thurmond in the bottom of the seventh. Ryan Riley led off with a single and moved to second when Steve Pyzik reached on an error by third baseman Jason Colson. Stone then followed with his first home run of the season, a shot to right field. It was just the second career home run in 193 career games for Stone, his first ever at Kingsmore Stadium. That brought Clemson to within 5-4, but that was as close as the Tigers could get. Winthrop added three more runs in the top of the ninth to take control of the game. The key hit of the ninth inning rally was a two-run single by catcher Stas Swerdzewski. Clemson Wins NY Tech Series 51-3 After a 24-3 win over the New York Institute of Technology on Friday, Clemson claimed 13-0 and 14-0 victories on Saturday. It marked the first time since Feb. 16, 1992 that Clemson won two games by shutout in the same day. Clemson swept Eastern Kentucky, 7-0 and 22-0 at Kingsmore Stadium that day. Boyd was 1 for 3 with a double and scored two runs against Ohio, but the pain continued and forced him to miss the two games with Georgia Southern. On March 14, he flew with team doctor Byron Harder to Tampa, FL to be checked out by a back specialist, who works primarily with major and minor league baseball players. The short-term prognosis is not good for Boyd, who is about halfway through the 5-6 week rehabilitation process. Clemson, South Carolina to Play Two More Times After splitting the first two games with the visiting team getting the victory, Clemson and South Carolina will meet two more times this season. The Tigers and Gamecocks will not meet again until a midweek game on April 18 in Columbia and a week later on April 25 in Clemson. The last the teams played four times in one season was in 1996. Clemson swept the four games that season by a combined 30-7. 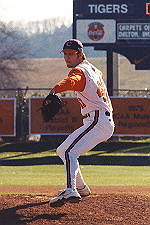 Clemson and South Carolina regularly played four-game series from 1993-1997.